Get to know our mountain with Deer Valley’s interactive trail map. Our resort spans the length of six mountains, covering more than 2,000 acres of skiable terrain that accommodates every level of skier. 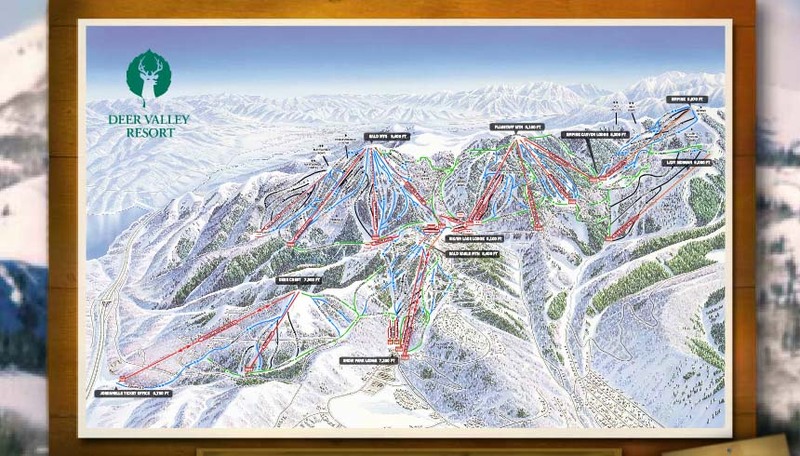 And with 21 chairlifts, you’re sure to discover a new favorite run – or 10. For our littlest guests, download the Children’s Adventure Area Map and discover a mountain of thrills and treasures that are tucked away on Deer Valley’s slopes. Lodging located in proximity to the Snow Park Lodge, our base area skier facility and Historic Main Street. All condominium properties, one bedroom or larger, feature a full kitchen and either a gas or wood-burning fireplace. Resort managed properties feature complimentary high-speed Internet access. Accommodations located in proximity to the Silver Lake Lodge, our mid-mountain skier facility. Rental cars are recommended where shuttles are unavailable. All condominium properties, one bedroom or larger, feature a full kitchen and either a gas or wood-burning fireplace. Resort managed properties feature complimentary high-speed Internet access. Deer Valley Resort ski rentals are available at Silver Lake Village in the Royal Plaza Building. Note: citywide transit runs less frequently in the mid-mountain area than in the base area. Featuring some of the newest lodging at Deer Valley Resort, located just a short driving distance to the Silver Lake Lodge, our mid-mountain skier facility. Rental cars are recommended where shuttles are unavailable. Ski-in/ski-out private homes, townhomes and lodge-style condominiums are available and all condominiums feature a full kitchen and either a gas or wood-burning fireplace.